Hey Reno/Sparks, NV! You’re an early state and we need some organizing hosts. Right now close to 1,500 events but nothing in Nevada's #2 population hub. We need some neighborhood buzz going there. You all can make a big difference! fwiw – I drove from San Francisco to Reno on multiple weekends in the 2020 primary for canvassing. Is Bernie Sanders the early 2020 front-runner? 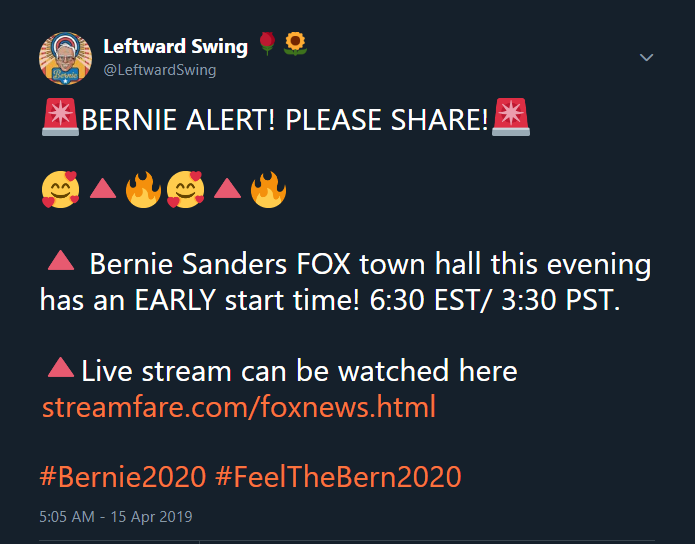 We are going to launch the first in a series of escalating events for getting attention and buzz for Bernie for 2020 Monday the 18th and Tuesday the 19th. You need access to a regular, non-mobile web browser. There will be a post here at the time of the event and a twitter blast. It will be obvious on Twitter because we expect to trend very fast. It will take participants about 10 seconds to a minute, hence the low commitment. Our action should get covered on CNN and other major media channels. We are keeping details under wraps until right before the event for the element of surprise. A link will be provided in a post here and in the Twitter blast. Based on turnout, we expect perhaps 40000 unique participants, 100k stretch goal, we will prepare a series of future actions. Our goal is to be low to medium commitment and medium to high impact. Events will be mostly online and most will be distinct from our first event with no detail blackout. We want to allow every single Sanders supporter to participate in meaningful mass action even if they can't quit their job to knock on doors. Other groups like Organizing For Bernie and Our Revolution will handle the major stuff and we will help people ease in and join the community. Sorry for the vagueness. Operational secrecy is crucial until the event starts. Note that Massachusetts has primaries that are open to unaffiliated voters, which means that if you are registered with a party, you have to vote in their primary, but if you are not registered with any party, you can choose which primary to vote in. Below are candidates from our BKAS series that have progressive values. In general, the list contains candidates who have Bernie-like positions – Medicare-for-All, increased minimum wage, getting money out of politics, free college tuition, etc. However, not every candidate may support every position Bernie has. If you don’t know the candidate, check out their linked webpage. If you are not comfortable voting for any of these candidates, you can find others running in these races listed on the Green Papers or Ballotpedia for US Senate, Ballotpedia for US House or Ballotpedia for Governor. Also, here is the link to the BKAS post on Massachusetts – Massachusetts , but note that it was written way back in late-October of 2017 and candidates have changed. Check the Green Papers or Ballotpedia links above for the most up-to-date list of candidates in your district. The list below includes candidates that have declared since that original Massachusetts post was made. Bob Massie seems like the strongest progressive candidate, though Jay Gonzalez’s platform is not bad either. Jimmy Tingle is running mate for Bob Massie and Quentin Palfrey is the running mate for Jay Gonzalez. Elizabeth Warren is the only Democrat running. She is fairly progressive on many things, though many Berners were disappointed that she failed to endorse Bernie in 2016 and has been timid on supporting progressive legislation. The only other candidate running who seems to be progressive is Joshua Ford, though very little information is available about him online and I could only find his CrowdPAC page. MA-03: Incumbent Niki Tsongas is not running for re-election. There are many Democratic candidates. I recommend voting for either Alexandra Chandler or Barbara L’Italien or possibly for Jeffrey Ballinger, though his website is a little less detailed. There is also a Justice Democrat candidate Juana Matias. Despite being endorsed by the Justice Democrats, I don’t think Juana’s platform is as strong as either Chandler or L’Italien. For instance, Juana says she would fight to “offer Medicare as a public option” to the ACA, while both Chandler and L’Italien are for Medicare-for-All. Matias also does not call for free college tuition, while the other candidates do. MA-06: Incumbent Seth Moulton is pretty conservative for a Democrat and a member of the neoliberal New Democrat Coalition. However, he does not have a progressive challenger. All the other candidates, Republican Joe Schneider, Veterans Party of America candidate Thomas Labo (no website) and independent Mary Charbonneau are also conservative, probably even more so than Moulton. MA-08: Incumbent Democrat Stephen Lynch is quite conservative for a Democrat. Brianna Wu is a much stronger progressive who supports Medicare-for-All and other progressive positions. MA-09: Incumbent Bill Keating is another conservative Democrat. He is being challenged by a good progressive Bill Cimbrelo. Here is Cimbrelo’s platform, which includes Medicare-for-All, a Federal Jobs Guarantee, $ 15/hr minimum wage, free college tuition, etc. Josh Zakin supports same day voter registration, automatic voter registration, weekend election days, no excuse absentee voting, ranked choice voting and election security (including risk limiting audits of the vote). Here are some state-level races. I haven’t had time to research them, so people will need to research the candidates in their district. These links are to the list of candidates for each race. These races will be on the November 6th ballot, but not on the primary ballot for September 4th. I’m listing them here, because I won’t have time to write about them on November 6th. You can read about them now and be prepared when the time comes. Note that Florida has closed primaries, which means you need to registered in the party to vote for their candidates in the primary. There are a couple of exceptions though. All voters can vote in a particular election if (1) if all the candidates for an office have the same party affiliation and the winner of the primary election will not face any opposition in the general election or (2) if the race is non-partisan (as some downballot races are). Below are candidates from our BKAS series that have progressive values. In general, the list contains candidates who have Bernie-like positions – Medicare-for-All, increased minimum wage, getting money out of politics, free college tuition, etc. However, not every candidate may support every position Bernie has. If you don’t know the candidate, check out their linked webpage. If you are not comfortable voting for any of these candidates, you can find others running in these races listed on the Green Papers or Ballotpedia for US Senate, Ballotpedia for US House or Ballotpedia for Governor. Also, here are links to the BKAS posts on Florida – Florida 1 and Florida 2, but note that they were written way back in mid-August of 2017 and candidates will have changed. Check the Green Papers or Ballotpedia links above for the most up-to-date list of candidates in your district. The list below includes candidates that have declared since those original Florida posts were made. Incumbent Bill Nelson is the only Democratic candidate. If you don’t want to support Nelson, there is a write-in candidate who says he supports universal healthcare Michael Levinson, though he comes across as a little wacky. There is also a candidate of the Socialist Workers Party running as a write-in Steven Warshell, though virtually no information is available about him online. FL-01: There are two Democratic candidates, Jennifer Zimmerman and Phil Ehr, but neither comes across as very progressive. FL-02: There are two Democratic candidates, Brandon Peters and Bob Rackleff, but neither comes across as particularly progressive. FL-04: There is only one Democratic candidate, Ges Selmont, though he does not come across as particularly progressive. There are also a couple of independent candidates, Joceline Berrios and Jason Bulger, that seem lean Democratic, though neither mentions Medicare-for-All on their websites. FL-05: There are two Democratic candidates, incumbent Al Lawson and Alvin Brown. Neither comes across as particularly progressive on their websites. This page comparing the two suggests Brown supports free college tuition and increasing the minimum wage to $ 15/hr, but neither of those positions is on his website, so…I’m not sure what he really supports. FL-06: There are three Democratic candidates, Stephen Sevigny, Nancy Soderberg and John Upchurch. Upchurch says he wants to “expand Medicare to cover all Americans”. He also supports raising the cap on contributions to Social Security. FL-09: The incumbent Democrat Darren Soto is part of the Medicare-for-All caucus, although overall he’s fairly conservative for a Democrat. His primary challenger is Alan Grayson, who supports allowing people to buy into Medicare. Grayson also has a strong platform on getting money out of politics. FL-10: There are two Democratic candidates, incumbent Val Demings, who is rather conservative for a Democrat, and Wade Darius. Darius supports Medicare-for-All, $ 15/hr minimum wage and free college tuition and other progressive stances. FL-11: There is one Democratic candidate, Dana Cottrell, who seems to be conservative Democrat overall, but does support tuition-free college education. However, note she also talks about the “Galveston model” of Social Security, which is a privatized type of retirement plan. There is a write-in candidate who seems much more progressive Luis Saldana. He has quotes from Bernie on his website, including mentions of Medicare-for-All and free college tuition. FL-12: Robert Tager supports Medicare-for-All or a public option to the ACA. Stephen Perenich supports regulating healthcare like a public utility to bring down costs. A third Democratic candidate, Chris Hunter, seems more conservative and only supports the ACA, but not anything further. There is also an independent, Angela Purkis, but her platform doesn’t really mention healthcare, but she does talk some about income inequality. FL-13: No recommendation. The only Democrat is Charlie Crist, whose voting record is quite conservative for a Democrat. FL-14: Kathy Castor. She is a somewhat moderate Democrat, but she is a member of the Medicare-for-All caucus. FL-17: April Freeman also has some good stances such as fighting income inequality, supporting unions and collective bargaining, reforming Wall Street, etc. But she does not seem to support Medicare-for-All. FL-18: Pam Keith (Justice Democrat candidate). She doesn’t mention Medicare-for-All on her website, but does on her Facebook page. FL-20: The incumbent Alcee Hastings supports Medicare-for-All and is a member of the Medicare-for-All caucus. His primary opponent, Sheila Cherfilus also supports Medicare-for-All and seems more progressive overall than Hastings. FL-21: Lois Frankel is part of the Medicare-for-All caucus. She is unopposed. FL-22: Jeff Fandl has his own plan to transition slowly to a Medicare-for-All type system. His other positions are progressive too, including free college tuition. FL-23: Tim Canova. Note that Tim Canova is running as an independent, which means he will not be on the Democratic primary ballot where only Debbie Wasserman-Schultz will be listed. You will be able to vote for Canova in the November general election. FL-24: The incumbent Frederica Wilson supports Medicare-for-All and is part of the Medicare-for-All caucus. She is being challenged by Ricardo De La Fuente, who does not support Medicare-for-All, but does address homelessness and affordable housing on his website. Note also that Ricardo De La Fuente is the son of Roque De La Fuente, a perennial candidate who is running as a Republican in multiple different states. I guess they figure that if the father doesn’t win, maybe the son will? FL-25: Mary Barzee Flores is the only Democratic candidate. She says “I believe in medicare for all, but I think the road to get there has to be traveled in a way that insures more people along the way, not fewer”. Not sure exactly what she means by that, because if Medicare-for-All is implemented the way it has been proposed so far, there will not be a time with fewer people covered. Flores supports free community college and waiving tuition at 4 year colleges for “students who face economic barriers”. FL-26: There are two Democrats running, Debbie Mucarsel-Powell and Demetries Grimes, but neither comes across as particularly progressive. FL-27: Lots of candidates here support Medicare-for-All and other progressive positions, including Michael Hepburn (Justice Democrat and Brand New Congress Candidate), Matt Haggman, Kristen Gonzalez and David Richardson. Another candidate Donna Shalala says she would “create a “Medicare Option for All” by enhancing Medicare to better cover routine dental and vision, and long-term care, and make it available to anyone regardless of income, immigration status, or age. At the same time, preserve employer coverage as an option for those Americans satisfied with their current coverage.” This is not as good as the traditional Medicare-for-All plan supported by Bernie and other progressives. Therefore, I’d recommend that voters don’t choose Shalala. Here are some state-level races. I mostly haven’t had time to research them (except for a few comments on them below), so people will need to research the candidates in their district. These links to candidates and issues for each race. Since 1998, when there were changes to the Florida constitution, the Secretary of State is not elected in Florida, but appointed by the Governor. Note that both Democratic candidates seem decent, but Ryan Torrens specifically states that he would not defend the “Stand-your-ground” laws in Florida. Note ballot measure 5 requires that 2/3rds of the legislature is needed to impose new taxes or fees. This means that it will become very difficult to raise taxes in the future if the state needs more income and will force cuts in services during recessions. I would vote no on that one. Ballot measure 12 prohibits public officials from lobbying for compensation while in office and for six years after leaving office. I think that is a good measure.